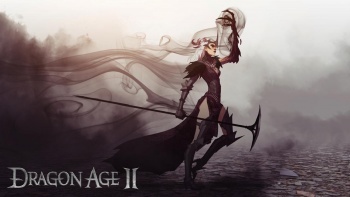 Players will spend at least 103 minutes of the upcoming Dragon Age 2 not actually playing the game. If there is one thing that Edmonton-based BioWare is known for, it's the strong writing in its popular RPGs. BioWare's games might not be the most original out there when it comes to story and characters, but said story and characters are almost always skillfully executed. A well-told, interesting yarn is something that gamers have come to expect from games like Dragon Age 2 - and that story will be communicated (at least in part) by a feature film's worth of cutscenes. According to the BBFC rating of the anticipated RPG (the game gets an 18+ rating thanks to its violence, natch), the "linear elements within the work" - also known as cutscenes - possess a running time of 103 minutes flat. This is, as previously mentioned, the length of an average feature film that you might see in theaters. Just because it's interesting - and timely - let's compare that to some of the Oscar nominees for Best Picture: 127 Hours (94 min), Black Swan (108 min), Inception (148 min), The King's Speech (118 min), Toy Story 3 (103 min), and True Grit (110 min). Now, this isn't a bad thing! There are many gamers who really enjoy watching a well-crafted cutscene that advances the plot - not everything needs to be interactive. For every gamer rolling their eyes at the idea of a game packing over a hundred minutes of cutscenes, there's another whose interest is all the more piqued because of it. Besides, 103 minutes is what, a long Metal Gear Solid cutscene?